The sun vanished. Night arrived. …Wait! I think I hear something! I never recalled my carpet being red. There’s a monster underneath my bed! Sheets pulled over my eyes. Every kid soon learns—those words are simply lies. No need to see—hearing is believing. Heart pounds in my chest. Reminding me of my final rest. A shadow eclipses me—my prayers—I read. Soon I’m going to bleed. Jagged claws upon my back. They dig, drag, and rake. I open my eyes—my fate is cruel and sinister. Just my damn little sister! 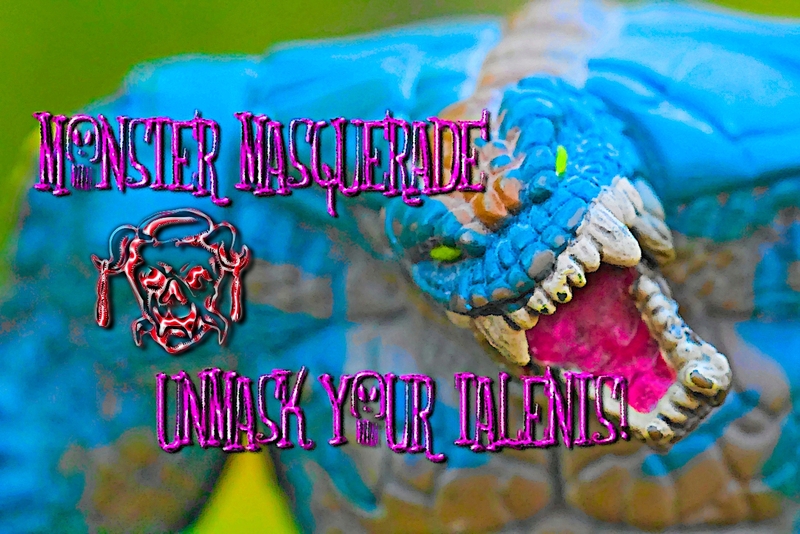 **FIND OUT MORE ABOUT JOINING MONSTER MASQUERADE BY CLICKING HERE! Spooky! NICE find, T!! ❤ Thank you. Two poems diverged in a wood, — and I took the one less traveled by, and that has made all the difference. Never heard of it. What’s it about?? Nope. Already have the medal in my car which I’m now driving off with and heading to the Bestest Monster Poet convention. Buh-bye! See ya! The room is empty. The convention is over. I have both medals. Better luck next year. Wake up, Fly! Wake UP!! Oh, you were having a dream… THE END. My dots get claustrophobic so they need space. Little sister? That ending was more horrific than I expected. She probably wants someone to get up in the middle of a freezing cold night to get her a glass of water or something. That is the scariest thing in the world you’ve ever written, BunK! Perhaps you should share this for all to see in our Monster Masquerade Event!! I must admit, it was pretty dark by my usual standards. If I’d really been doubling down on the horror, I could have added that she wanted a cheese sandwich too. I’ll make sure he gets your message!